15° Shower or two clearing. Jack Ziebell had a big game with 29 disposals, 15 contested possessions, 11 clearances, two goals and 701 metres gained for his side. Drew Petrie has five intercept possessions for the quarter, including the last two for North Melbourne. Essendon InterchangeDustin Fletcher off due to an injury. 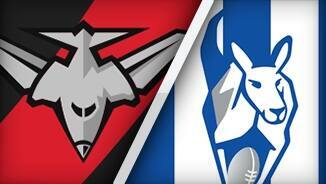 Bombers InterchangeDustin Fletcher off due to an injury. Sam Gibson has had nine disposals and four score involvements for the quarter. The Kangaroos kick their third goal from a centre bounce clearance for the night and now lead by 17 with three minutes to go. The Kangaroos struggled from set shots 4150 out all night, but Higgins kicks one from exactly this range to give them an 11 point lead. 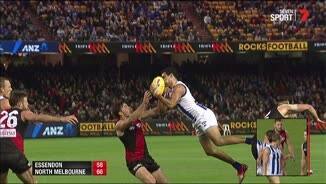 North Melbourne InterchangeRyan Bastinac replaces Robin Nahas due to the blood rule. Kangaroos InterchangeRobin Nahas off due to the blood rule. Michael Hurley saves a North Melbourne scoring chance with his 10th intercept possession of the gameleading all players. Essendon InterchangeCourtenay Dempsey off due to an injury. Bombers InterchangeCourtenay Dempsey off due to an injury. 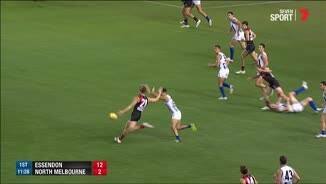 Brendon Goddard assists the last Bombers goal, he has won four of the Bombers six clearances this quarter. Jack Ziebell with 24 kicks and three handballs. No player has had more than 27 kicks in a game this season. North Melbourne finding the space this quarter with 18 uncontested marks to six. Melksham involved in both Essendon goals this quarter; launching the first and kicking the second. 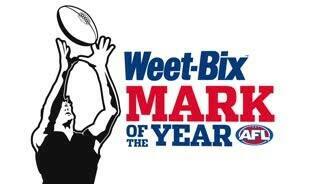 North Melbourne honouring the ALeague Grand Final this weekend with two goals from ground kicks this quarter. North Melbourne continue to struggle from set shots with 6.11 from this source including 2.8 from 4150 metres. 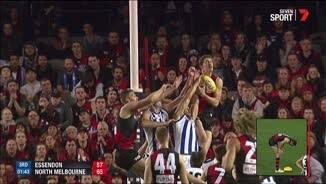 North Melbourne has won five forward 50 intercepts but has scored just two behinds from these. Essendon has taken two contested marks inside 50 both in the last 15 minutes of gametime. North Melbourne has won the groundballgets (contested possessions at ground level) in all three quarters tonight. It leads the count 64-52 and Ben Cunnington leads all players with seven. Joe Daniher has played an unusual game for a forward, with two marks and eight spoils so far tonight. 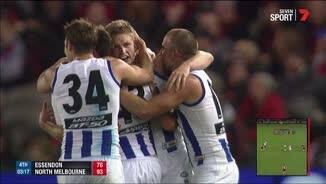 North Melbourne has scored 11 times from Essendon turnovers, the Bombers have done so just six times. Kangaroos InterchangeBen Brown off due to an injury. Kangaroos InterchangeAndrew Swallow off due to an injury. Bombers InterchangeKyle Langford off due to an injury. Welcome to Etihad Stadium for the Essendon v North Melbourne Round 7 clash. JACK Ziebell has led North Melbourne to an important 11-point victory over Essendon, compounding another difficult week for the Bombers in their ongoing supplements saga. The Kangaroos vice-captain produced one of the most clinical displays of his career at Etihad Stadium on Friday night, as the Roos ran out 13.15 (93) to 12.10 (82) winners. He collected 29 disposals (15 contested), had 11 clearances and kicked two goals, the last of which was the sealer from outside 50 late in the final term, shortly after Shaun Higgins had threaded a set shot to give North some much-needed breathing space. 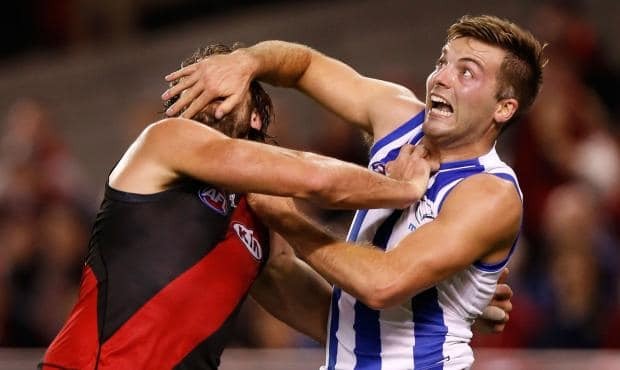 The Roos improved to 4-3 for the season and jumped into the top eight with the victory, while Essendon dropped to 3-4 with the loss, falling to North Melbourne for the fourth time in their past five meetings, including last year’s elimination final. It was a bitter end to a challenging week for the Bombers following the news the World Anti-Doping Agency will appeal the AFL Anti-Doping Tribunal's decision to clear 34 past and present Essendon players of using a banned substance. It means the scandal, which has already overshadowed two seasons, is likely to extend well into 2015 for the embattled club. The win could come at a cost for the Roos, who had to substitute key forward Ben Brown out of the game in the third term with a left knee injury. 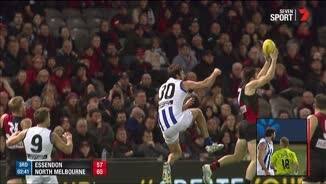 Fellow forward Jarrad Waite was also reported in the same quarter for striking young Bomber Zach Merrett. The Roos weren't overly convincing, and are certainly not yet in the form that saw them progress to last year's preliminary final. 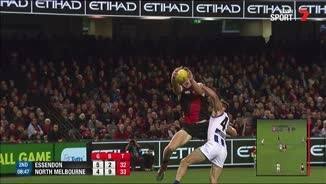 But they withstood several Essendon challenges throughout the game and registered their fourth victory of the season, which puts them ahead of the ledger at an important stage of the campaign. North coach Brad Scott was pleased with the character his team had shown to get over the line against the Bombers. "I thought we earned our win. The opposition were good, they play a pretty good defensive style of game and we've got a lot of respect for their capabilities and their assets as a club. We had to play well to win," Scott said. 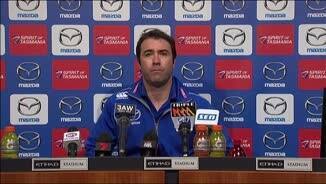 Scott was not concerned that the Roos' inaccuracy in front of goal would be a lasting problem. "Lindsay Thomas kicked five straight last week, so I don't think it's an issue for us," he said. "Some really good kicks missed some pretty easy set shots, but I think it takes great character and great resilience to be able to come back from missing a few easy ones. "I thought Shaun Higgins just demonstrated that beautifully. He missed a few easy set shots and after a minute's break in play (in the last quarter) he went back and nailed one he needed to nail." Lachlan Hansen was terrific in defence in just his second game of the year, dragging in 14 marks, collecting 24 disposals and managing to stop Essendon's forward thrusts in an array of ways. Ben Cunnington added some grunt, Drew Petrie was rock-solid when switched into defence in the final term, and Higgins continued his strong start to his first season as a Kangaroo. Michael Hurley's claims as one of the in-form key defenders in the competition continued, with the Bomber his side's best. Mark Baguley shut down North veteran Brent Harvey, while Dyson Heppell spent more time off half-back but was still prolific with 29 disposals and eight clearances. With Jake Carlisle a late withdrawal after suffering a neck injury at training on Wednesday, the move of Jobe Watson to full forward early on was as much a surprise as it was a reprise. The Essendon skipper, who started his career as a deep forward, booted two goals in the opening term after marks on the lead, in a positional switch that wouldn't have been expected by the Roos. His success there early on Friday night, alongside speedster Travis Colyer who also kicked two first-term majors, added some vibrancy to a forward mix that has struggled for potency all season. 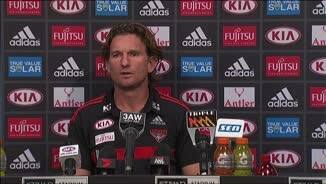 "I thought we performed OK,” Essendon coach James Hird said. Essendon's 12-point advantage at the opening break was due to their faster ball movement, but also in part thanks to the Roos' inaccuracy; they kicked 2.6 for the term, including two shots from Waite that hit the post. The Roos' inability to convert slowed after the first term, however, when they slammed on the first five goals of the second term and held the Bombers goalless until the final minute of the half. 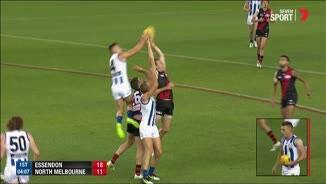 The momentum shift stemmed from a contentious umpiring decision where Shaun McKernan, in his first game as a Bomber after replacing Carlisle, was not awarded a mark at the top of the goalsquare. He was ruled to have not controlled the overhead grab – which he took in the air and pulled down to waist height before it was spilled – and the ball swung to the other end where Harvey coolly slotted his shot to give the Roos the lead. 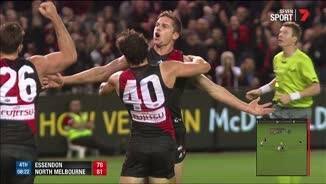 The Bombers started the third term with another period of dominance and snatched the lead back in a quarter punctuated with huge marks from Joe Daniher and Lindsay Thomas. The opposing pair, who have had their share of goalkicking problems, missed the ensuing shots. It was not to be the last of the drama, as North held off a spirited Essendon final-quarter charge. Essendon: Kyle Langford replaced by Ben Howlett at half time. 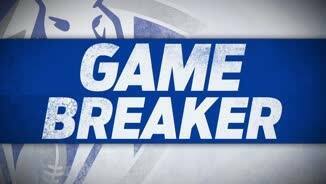 North Melbourne: Ben Brown replaced by Shaun Atley in the third quarter.